If high-quality photography is a priority for you at your wedding, stop your search right now and hire Summer and Stephen. 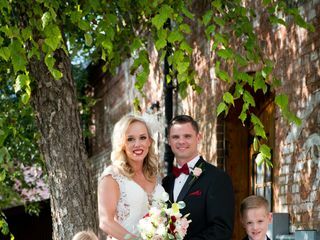 Put simply, this husband and wife team are the best wedding photographers in Greenville. When you first meet them and have a million questions about what they offer and how they approach things, rest assured that Summer will get back to you usually within hours, if not minutes. In the combined decades of experience these guys have, they've seen it all. There's nothing they can't handle, and there isn't a detail they'll miss. They show up incredibly professional and prepared, ready to make sure you can relax on the biggest day of your life. While shooting, Summer and Stephen are super fun to work with. Don’t worry about fake smiles in your pictures – Stephen will have you stress-free and genuinely laughing the entire time. There isn’t anyone in the world we would have rather hired or worked with on our wedding day – thank you so much Summer and Stephen, for beautifully capturing these memories that will last a lifetime. This is the best review ever Michael. Thank you so much. We were so happy to be a part of the whole process with you and Lindsay. Summer and Stephen were absolutely amazing from the first meeting, though engagements, planning and on the big day! 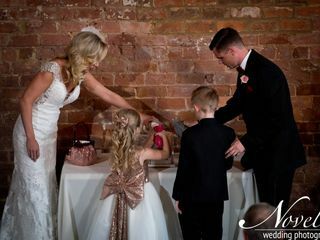 We selected them because they are not only fantastic photographers, but they KNOW the wedding business and are so helpful all throughout the process. They stayed in communication and were extremely well planned and organized. They weren't afraid to do whatever crazy things we wanted to do and they captured all the important moments and then some! They made us feel so comfortable and everything flowed seamlessly from one event to the other. During the big day I never felt rushed (other than when Stephen had to get on to our bridal party for being chatty during group pictures, LOL) and I was able to fully enjoy every moment of the best day of my life. The photos came back SUPER fast, in just a week and the box with the flash drive and mini album were awesome! We did videography as well and it was work every penny of the extra cost. The preview video is absolutely beautiful and I know we will watch that over and over throughout the years, probably more than we will ever look at the photos. 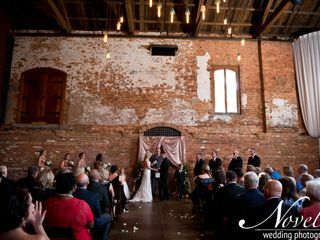 All of our vows were clearly and perfectly captured and the wonderful memories will be with us forever. We are forever grateful for Summer and Stephen and all they did to make sure our day was everything we hoped for. THANK YOU! We absolutely loved our photographers! They were so kind, helpful, and fun! They made our big day go smoothly, and they captured so many photos of us and our friends/family that we adore. We couldn't be more happy with the work they did, and how they captured every single detail of our special day! Stephen & Summer are genuine, amazing people who are so incredibly talented and love what they do! They are extremely professional, responsive, educated, helpful, FUN, and passionate about their work! When my husband and I had our first initial meeting with them, they answered every question that we had and stayed in the meeting for as long as it took for us to walk out of there knowing exactly what we would be paying for. They invested a ton of time into us with having no promises of anything in return, and that is when we knew that they were the photographers for us. Not to mention, we stalked their work and it was ALL amazing. They really allowed us to be 'us' during all of the photo-shoots. Nothing got too 'posey' and they let us to be natural! They made us laugh to loosen us up! Whenever I would send them an email with a question, Summer would normally reply that day, if not, the day after. They communicated very well and ensured everything stayed on schedule the day of the wedding! The accommodated all of our 'special requests' and there was not any photos that I wanted that they missed. The photos for our engagements, bridals, and wedding all came back SUPER FAST! We are forever grateful to Stephen & Summer for capturing our special day and could have not picked better photographers!! Highly recommended! Awe Ashtin! We gushed when we saw this review. It just made my day and it has been our pleasure working with and getting to know you and Jay over this past year. 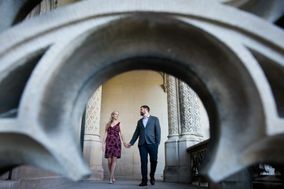 My husband and I really struggled to find the right photographer for our wedding - until we spoke with Stephen and Summer. We were thrilled to find such a talented, professional, and energetic couple to capture our big day in the North Carolina mountains! They shared our vision for truly creative yet timeless, elegant photography. After speaking with Noveli for the first time we knew they were the photographers for us. Stephen did an amazing job of walking us through how the entire day would play out hour by hour and how they would photograph each piece of the wedding/reception. Both Stephen and Summer were very responsive and always made time to speak with us if we had questions. They are extremely organized and experienced photographers who bring a very high quality to their work. In addition to photography, we also worked with Noveli for videography to record our ceremony and first dances. 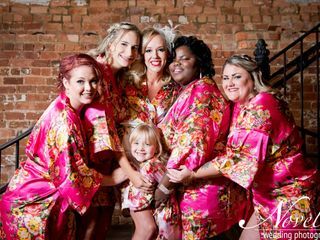 Throughout the wedding and reception, they were very easy to work with and always had helpful hints to make the day flawless. They even hung in there with us when the weather turned cold (40 degrees and windy!) during post-ceremony pictures. Regardless of the weather, the photos that we received are gorgeous and beautifully captured our special day. We could not imagine better photographers or better people to work with! Thank you - Stephen and Summer! What a nice way to kick off New Years Eve! Thank you Ellen & Dan for such a beautiful review. We will never forget your beautiful wedding. Summer, Stephen and the team were great. We had some really hot weather for our pictures outside and they never slowed down. We were really worried about how the pictures would turn out since my husband has the worse fake smile imaginable but somehow they managed to capture amazing photos that day. They did an amazing job and turnaround was very fast. Highly recommend them! Thank you for such wonderful words. We are so happy for you guys. Congratulations and good luck with this next chapter. When I first met Stephen and Summer they were so welcoming and warm!! They didn’t try to push anything on to me and stayed as long as I had questions. After I booked them and had had follow up questions they were ALWAYS quick to respond even late at night, which I valued a lot! The pictures to our wedding turned out fabulous and everyone that has seen them loves them. If I ever have another even for anything I will definitely be calling them!! Oh and when I did my bridal photos they made me laugh so I could loosen up!! Summer and Stephen are more like family now. To my moms wedding, to engagement pictures, to our wedding we have gotten to know them not only as the best photographers in the area but as truly wonderful people! I requested that they take our engagement pictures in Rock Hill, (2 hours away) because I knew 100% they were who I wanted to capture our special memories. Don’t look anywhere else. You’ve got your wedding photographers right here! Thank you Lizzie! We love that we are family, and you all hold a special place in our hearts! Cannot wait to see you all soon! Wow! Where to even start about Summer and Stephen! They are simply incredible! They are amazing photographers and amazing people! We were blown away with their professionalism from the initial meeting through engagement and bridal portraits and during the entire wedding. They made us feel so comfortable and the sessions were so much fun! 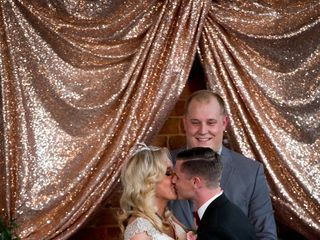 We are so thankful we booked them as our wedding photographers! We had the most incredible experience with Noveli at our wedding. We truly believe that they are the best photography and videography around! The pictures turned out amazing. I can't wait to see the video. The crew was outstanding and made us feel comfortable the entire time. Cristina and Al are wonderful photographers. They were so creative in their ideas for photos. They also kept us laughing the entire time! The videographers were very talented as well. Laron & Justice blended into the background. I had requested audio of my husband and I reading letters to each other. Laron and Justice made sure they accommodated my requests. I didn't even know they were there during the ceremony. Even my mom was wondering where the video crew was. Noveli exceeded my expectations in every way. I will cherish these photos forever! They were so fun to work with! Thy were very organized and professional and able to work around any scheduling problems. They will make sure you don’t have to worry about anything on your wedding day while taking beautiful pictures for you. They do an amazing job of tailoring their photography to fit your personal style. Hiring these guys was the best decision we made in regards to our wedding! 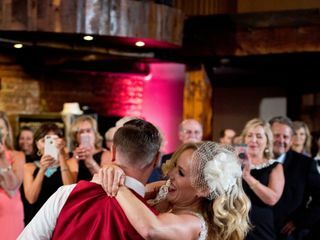 They’re energetic, made every moment count, were so sweet to family members who wanted to be chief, and literally served as the wedding director as well as photographer. They knew how to get smiles out of everyone and posed people so effortlessly that we all felt like models! Could not be more pleased with any duo photographers than this couple. Do yourself a favor and hire them. Thank you for the review Jessi! We loved your day so much. I couldn’t have asked for better photographers for all my photos. From engagement pictures to bridals and our big day, Summer and Stephen were absolutely amazing! They make you feel so comfortable with even the most awkward poses. At the ceremony none of my guests knew where they were. They are great with being out of the way, and they still caught every single angle! They are the absolute best and I would recommend them to anyone!! Thank you Asheley & Tyler! We enjoyed being a part of your entire process and wonderful wedding day! Christina and Al are the bomb dot com. They were so nice and flexible and made everything I found on Pinterest(lol) a reality. Summer and Steven & their entire team/crew were super professional & both met and exceeded our expectations!! They captured some of the most precious & fun moments, were prepared, professional-- can't wait to see our video in the coming weeks!! Thanks for your work & commitment to our wedding day!! Thank you Anne. You, Tom and both of your families were just amazing and we loved capturing your day. What an amazing experience. Summer and Stephen took our wedding to a whole new level. We are very happy how everything turned out and would recommend them and their team to anyone. They allowed us to capture the perfect moments of our special day and keep them for the rest of our lives. Thank you TJ! You guys are incredible and we were so honored to be a part of your day! We had the pleasure of working with Jannette and Matt for our wedding photos this year and they were absolutely amazing! Jannette and Matt made us feel so comfortable and they were tons of fun! I highly recommend this company and their team! Loved loved the videographers!! I can’t wait to see the what they captured on my wedding day!! Very nice and sweet men that helped make my day special!! Summer and Stephen are incredible! From the beginning they were so professional, but also a lot of fun! They make you feel so comfortable and relaxed during the posed shots and take a great mix of classic shots and some that are more creative (which I loved)! During the reception, I hardly noticed they were there! When I saw all the photos after, I was blown away with variety, they captured everything from all the small details to the special moments. I would recommend them 100% to anyone needing a photographer, wedding or otherwise. They have such a passion and are truly remarkable at what they do! Noveli was a joy to work with and made our special day so amazing. Kelly and Al were everything we were looking for when picking our photographers. We did our engagement photos, bridal portrait, and wedding photos with them. Every time we met up with them, they were cheerful and helpful and we felt like they really cared about us as friends rather than just as clients. Kelly had the eye for creative and beautiful shots, while Al always knew the right kind of lighting and was constantly making us smile. It was so nice to come home from our honeymoon with our pictures in hand so that we could relive our wedding all over again. Thank you to Kelly, Al, and the entire Noveli team! Thank you Jackie. We just loved you and your family. Congratulations again! Noveli Photography was fantastic. I would recommend to anyone who wants the best for their big day. I loved how much time they took to make sure the mood and style of the photos was in line with what we wanted; that was very important to me. Summer and Stephen are THE best! They provide the perfect experience. From start to finish they are both personal and professional! If I could do it over and over I would choose them EVERY time! I can't say enough about how perfectly they captured our day! Noveli can't be beat! Thank you so much Rebekah! You have no idea how much we love you and all of your family. We wish you the best! Where do I even begin? Steven and Summer and the entire Noveli team we're AMAZING! From our first consultation I knew that entrusting them with our wedding photography was a no-brainer! They walked my mother and I step-by-step through the wedding day and created a timeline that made sure we got the photography we wanted/needed and also that everything ran smoothly. We did my bridal portraits 4 days before the wedding because of alterations issues with my dress and they had the photos turned around and delivered to me in less than 24 hours! They then allowed me to pick my favorites and supplied a large digital photo frame so guests could see my Bridal Portraits at the reception despite just being taken 4 days before hand!! In the midst of the chaos of the day Summer and Steven were calm, cool and collected they managed my crazy wedding coordinator and my opinionated family with ease. Noveli went above and beyond staying an extra hour to capture our grand exit and their signature "LOVE" shot. This extra time allowed us to dance and mingle with our guests before leaving. I did not expect this and in the wedding industry this kind of service and care is rare. The memories that Steven and Summer have given my husband and me from our wedding day far exceeded all of my expectations. It was 102 degrees and they withstood the heat like it was nothing so we could get beautiful outdoor shots on the golf course like I had envisioned in my head. I could go on and on, but if you want incredible photos and a photography team that will cause you zero stress and have a blast book Steven and Summer ASAP!! You won't regret it! Susan - Thank you SO much for your kind words. We had so much fun with you and your family and would do it again and again.